I regard Thucydides as one of the key figures in history because he gave us work, the History of the Peloponnesian War, that truly has last for all time. Many theories derive from his work, but is he a theorist per se? More specifically, is he a military theorist? Here is a brief argument suggesting no, but yes. Thucydides is not a military theorist because he does not posit a particular theory regarding the military and war. He is an historian attempting a syngraphe “as a possession for all time.” He clearly makes this point in the opening pages of his book. However, many theories do emerge from his retelling of the Peloponnesian War. He unveils a theory of predictive human nature. That theory translates into a theory of predictive state behavior. From those emerge realism theory of international relations. 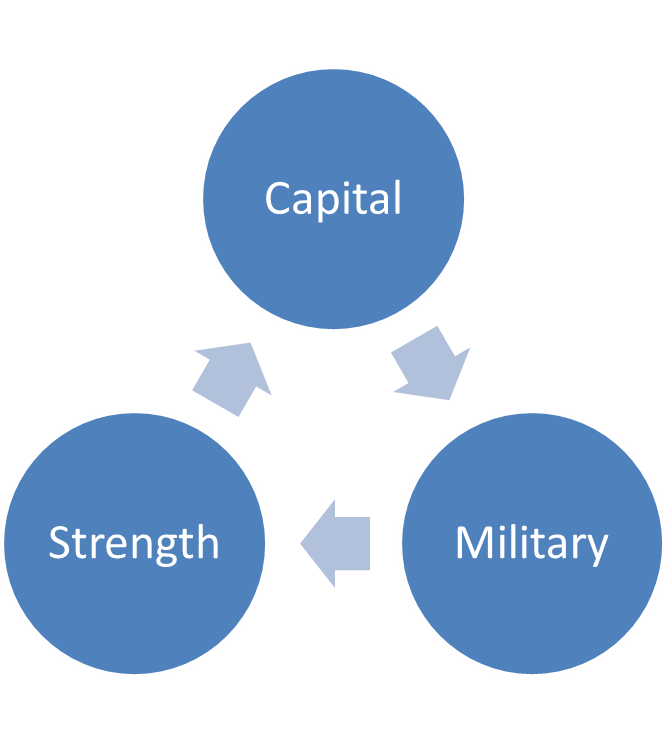 Embedded in realism theory one finds a power theory based on interdependent relationships between capital power, military power, and strength. Using Paul Reynolds’ framework for theory analysis, Thucydides’ demonstration of realism theory and the power subset, meets the criteria of a valid theory. Thucydides wrote an account of the Peloponnesian war that took place in stages between 431-404 B.C. Athens threatened the livelihood of Peloponnesus. Athens had enjoyed expanding wealth, which strengthened her military. She was a rising superpower. These factors were attributable to her unique, democratic form of governance. Athenian power threatened the Peloponnesians, so Sparta voted to break a peace treaty they made with Athens. Sparta’s vote initiated a 27-year long war with Athens. Thucydides, an Athenian general, retells the war from both sides. In his view, this war is the greatest that the world has ever known. He thinks previous historical accounts of wars fail to capture the scope and gravity of the interplay between polity and war. He believes his retelling of the Peloponnesian war will be an altogether different historical account because he thinks his methodology portrays the struggle between Athens and the Peloponnesus more accurately than previous histories. First, Thucydides claims to be objective and impartial. By impartial he means he will tell both sides of the story despite being Athenian himself. Second, he uses at least four types of sources to inform his writing. Some elements of the war he observes personally. He refers to official documents. He cites literary sources, such as Homer. He also relies on what he deems are trustworthy oral sources. Third, he uses an annalistic method to arrange the events as they occur. By writing a chronology arranged by summers and winters, he seeks to achieve a level of accuracy in the timeline that reflects a truer telling of the events. This technique creates a common understanding of the timeline and the events in the timeline in relation to each other. Fourth, he relies heavily on rhetorical speeches and dialogues to demonstrate the political thoughts of all sides involved in the war. The speeches contain general remarks and are not verbatim renditions. One must understand that despite Thucydides’ claim to impartiality, he does handle the speakers of different sides, differently, which indicates a certain bias toward the point he attempts to illustrate. He does the aforementioned things to establish credibility in terms of his empirical relevance. Fifth, he uses a literary, narrative style of writing. His work is as much literature as it is an historical work. He uses balance and contrast, rhetorical symmetry, dramatic irony, and poetic language. The literary devices are his way of presenting causal relationships and underlying thoughts, which the reader should logically interpret. Thus, he builds intersubjectivity into the literary rendering. As Thucydides carries the reader through the war, he inadvertently introduces a foundational trifecta of classical realism theory. The trifecta of realism power revolves around the relationship between capital, military might, and strength (See Figure 1). He captures the concept of power as a function of strength in an Athenian speech where they purport, “it has always been the law that the weaker should be subject to the stronger.” This is the first of many axiomatic statements Thucydides makes regarding power. His most famous axiomatic statement occurs in the Melian dialogue. Repeatedly Thucydides highlights Athens’ economy. He says their strength comes from an ability to raise revenue. Athens derives capital resources from investments domestically and through international alliances. Those resources provide fiscal flexibility to pursue domestic and international strategies. Specifically, Athens has the flexibility to allocate substantial resources toward building her military. Thucydides asserts that because Athens has significant capital resources, she therefore has better military resources. His point is specific to Athens, but the idea behind his point is abstract; money buys military capability. Today, the United States derives tremendous resource allocation flexibility from strong capital revenues. The U.S. spends more in real dollars for military expenditures than all the major developed countries combined. Arguably, U.S. economic strength enables the U.S. to purchase military power. Thucydides suggests that when Athens applies a combined arms strategy of naval and land forces, her military power is almost unmatched. This causal relationship is in large part due to her ability to project power using triremes. The trireme was an innovative tool to project military power. Spartan commanders acknowledge this point when appealing to Spartan bravery against Athenian capability. Because Athens owns the greater share of triremes, she owns greater command of the seas. Thucydides implies that the flexibility of a nation to project power is a “set-of-laws” that gives a nation the capacity to exercise strength. Using Reynolds’ abstractness measure, this principle is applicable today. The U.S., for instance, owns the greatest share of aircraft carriers, a modern, innovative platform of power projection. The third factor of power is the sum of capital resources and military might, which is a nation's strength. Figure 1 depicts the Thucydidian trifecta of power. The reader sees a contest of strength between Athens and Sparta. Thucydides shows that Athens' strength by virtue of her economy and military make her the dominant power of Hellas. That power is what Sparta fears because that power potentially subjects the Spartan way of life to Athenian rule. Sparta will have to erode Athenian capital streams and military might to reduce Athenian strength, which effectively happens after Athens invades Sicily. Thucydides establishes another “set-of-laws” by describing Athens’ downfall as a function of her mismanagement of the power trifecta. Sparta follows the laws of power and earns supremacy over Athens. Reynolds says, “[t]he final test of any concept or statement is whether or not it is adopted by other scientists as useful for the goals of science.” Realism concepts are used today. Thucydides uses all three of Reynolds’ forms of theory. His abstractness establishes the foundational realism doctrine of power, which Hans Morgenthau codifies in his six realism principles. Through a rigorous annalistic technique and the use of literary devices, he creates intersubjectivity. He places an emphasis on establishing the credibility of his empirical findings. Despite some bias toward framing key points, one should maintain confidence that his rendition is empirically relevant. Therefore, Thucydides’ explications of the basis of realism theory and the power trifecta work as theories. Thucydides, 1.76.2, p. 43. See also 3.82.2, p. 199 and 4.108.4, p. 282 and 4.61.5, p. 256. Morgenthau, pp. 4-16. The foundational basis of realism theory is derived in large part from the Melian dialogue (Thucydides, 5.89, p. 352). Throughout Thucydides’ book, he demonstrates how power and self-interest motivate international interaction and conflict. Reynolds’ basis for scientific knowledge follows three criteria: abstractness, intersubjectivity, and empirical relevance (pp. 13-14). Additionally, he identifies three forms of theory: “set-of-laws,” axiomatic and causal (pp. 10-11). Thucydides, 2.37, p. 112. See also, 8.97.2, p. 540. Ibid. He explains his methodology at 1.21 and 1.22. This is a demonstration of Reynolds’ criteria for intersubjectivity. His bias generally favors a point and not necessarily a particular side. However, one does get a sense of his appreciation for individuals such as Pericles and Nicias whereas one senses a dislike for Cleon. One of Reynolds’ criteria for scientific knowledge is empirical relevance. Thucydides uses these factors to create depth of understanding the struggle between Athens and Sparta. One of Reynolds’ forms of theory is the “causal process” form. See p. 97. Ibid. See also 1.141.5-6, p.81. Thucydides, 2.89, pp. 145-146. The speech by Phormio highlights many of the military strengths of Athens. Thucydides, 2.87, pp. 144-145. The Spartan commanders understood they were far less experienced than the Athenian soldiers were. Therefore, they needed to rely on bravery over experience to defeat the Athenians. Reynolds describes one form of theory as “set-of-laws” which are well-supported generalizations. See p. 10. Thucydides, 7.18.2, p. 436. See also 7.27, p. 442 and 7.28, p. 443. Additionally 7.87, p. 478. Thucydides, Epilogue, §5, p. 550. Morgenthau, p. 10. Morgenthau’s codification is a contemporary demonstration of the abstractness of realism concepts.